Home MTAANI NEWS Thika woman’s gesture on polling day leaves Kenyans in awe. Thika woman’s gesture on polling day leaves Kenyans in awe. 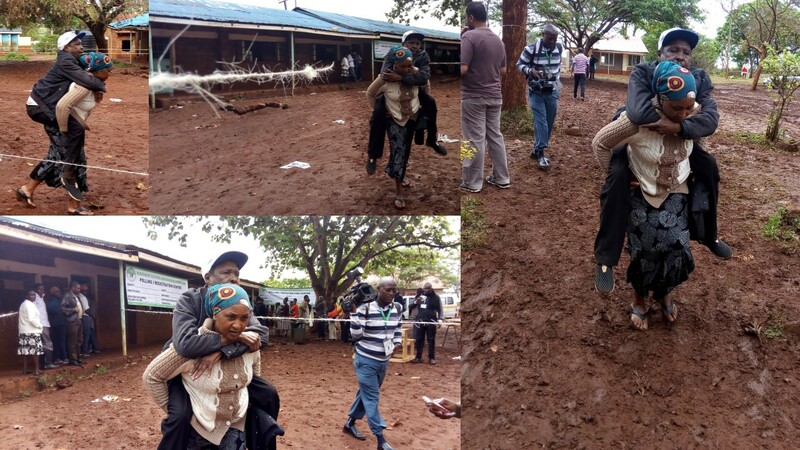 Elizabeth Wambui gesture to carry her husband on her back to the polling station has left many Kenyans fascinated and humbled for her humility. This is unlike majority of the ‘modern’ woman who is said to be very ‘independent’ and liberal to humble themselves to that level. Some of those who commented about her photo on social media hoped their wives saw it and learnt one or two things about ‘how to be a wife’. “An ideal wife is known during tough times when she sticks by her husband through the storms. This woman is one in a million,” commented one guy. Elizabeth carried her disabled husband, Peter Kinoru Mwicigi, on her back to go and vote at Heshima Primary School. When asked why she had to go to that level she said that she had to do so as to fulfil her husband’s desire to cast his vote despite his disability. “It’s my duty as a wife to be there for him (husband) at all times especially now that his limbs have been paralysed. I am happy that I have played my part to ensure that he participated in the polls,” explained Elizabeth. She reckoned that as a common mwananchi, they had suffered due to the prolonged electioneering period and it was high time Kenyans settled this once and for all through the ballot. Mwicigi supported her sentiments by adding that he was very happy that he voted, something that would not have been possible had it not been for his wife. He wished that after this, President Uhuru would emerge victorious and use his remaining term to unite all the people of Kenya. Mwicigi’s predicaments started in 1999 when he developed some swelling on his leg and consequently underwent some surgery at the Thika Level 5 Hospital. However, his health did not improve but instead paralysed from his waist downwards, making it impossible for him to walk on his own. Ever since, his mobility has been dependent of his wife who he says has been very helpful and patient with him. The couple lives near the BAT Company in Hospital Ward.